Hi Guys, I have just joined, as due to a few injuries in my old age (44) I have to take up a sport that is less taxing for a while! I know jack about paddle boarding but have always been involved in some form of water sport. I am after advice on boards, just been looking at the Atlantis Glider Soft 2017. I don't want to splash a heap of cash in case it turns out I don't like it or I'm super crap at it!. Thanks in advance. Not like it?!? How could you not like it? What is you weight? And have you surfed or done anything that requires good balance? Where will you paddle: river, ocean, bay surf, ocean surf? All that info helps in recommending a board. I don't know the "Atlantis Glider Soft", but an 11' board will be a good place to start. But lots of people start by "trying it out", they get hooked, and they may regret the choice of their "try out" board. Have you tried renting a board? Have you been to a shop and demo'd a board? You'll learn a lot by giving it a go a couple of times. Thanks cantSUPenough! Does riding racehorses class as good balance lolI will mainly use ocean/bay/rivers. Haven't rented a board yet but maybe that's prob a good place to start! I think TheSurfboardwarehouse are a great place to start. They have specials at moment. Why not consider the Waterborne Simplicity instead. The Atlantis Halo would also be good. Thanks Gboots, the surfboard warehouse is where I saw the Atlantis. Is the a reason why the waterborne or halo would be a better pick??? Atlantis glider will be fine to learn on. It will be heavy but at the price you cannot go wrong. If you like the sport you can get a better board in the future that suits the kind of riding you want to do. No one board can do it all from surf to flat water. What's a deck pad & can I put one on it? It will be fine and is a softboard so no need for deckgrip. I am a beginner and wants to buy a sup board, but i never try it before. female, 164cm, 54kg. i want to paddle in river/ocean.flat water is ok to me. is there any recommendation about my first sup board? Actually I want to buy one as my birthday gift ,haha. Last week i went to a store and saw the brand red paddle. the inflatable board is very strong, lightweight(easy for girl to carry), and has good reviews online but the package price $1599 is over my budget(below $800). Then i found another brand CMP australia, there are a lot of ads about it, it's much cheaper than red paddle but i can't find any review of the brand from other people. is there anyone used it before? If you want an inflatable I would stick with a leading brand . Red Paddle are great . 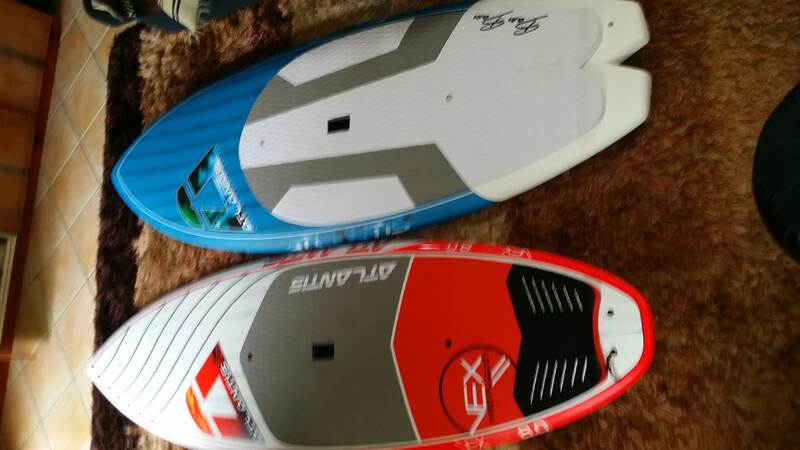 I have a Starboard from 2014 and they are great and have improved even further . I hope I am not stepping out of line to reply to your post but here is my honest opinion (As someone who works for The Surfboard Warehouse), the Atlantis Glider is a great place to start and would suffice as a starter board. However as Gboots stated, you can't really go past the price on the Waterborn Simplicity at present. For a few extra $$$ you will be getting a board that holds better resale value (Depending on your area, a lot of people resell for basically what they pay for them.. I know its crazy). And as CantSUPenough says, you may love the sport and want to upgrade models or simply pass it on if the sports not for you; but either way you will get a good return on your investment. Secondly, the Atlantis Glider is a slick flat bottom board with no contours or concave, meaning, that the Simplicity will glide through the water better, perform turns better and ultimately be a better ride. Hope this helps, any other info you need we are only a webchat or phone call away. Hey Andrew, No def not stepping out of line by commenting and thank you for your feedback as it's exactly what I'm after I will go and check out the Simplicity. If I do end up with one, would it be the sort of board I would keep long term as I don't want to have to keep upgrading! Thanks again to everyone who has given me feedback, it's been really helpful! Yes the Simplicity is a board you can use and keep long term. The shape is designed for general use and is super stable (for instance its my go to board for SUPyoga or a quick paddle with the misses and the dog down the local creek). One of the main reasons people typically upgrade is to have multiple boards to suit multiple situations. For instance, you may fall in love with surfing your SUP, but purchase a shape (such as the Simplicity) that is designed with stability in mind over surf performance and end up getting a performance shape specifically for the surf later or alternatively you might like long distance paddling for fitness and decide that later you want to get a touring SUP that makes travelling further distances easier. So to summarise, if you just want to go for a simple paddle with friends, your partner or your dog, a board like the Simplicity may be the only board you ever purchase.... Or on the other hand you may end up like many of us here who fill their garage with more SUPS and surfboards than you can count and collect them as if they were basketballs cards!! The CMP boards are great entry level boards from a reputable company based on the Central Coast. Weekend Warrior, run by local waterman Chad Pace and his wife Carmen. They have been operating successfully for quite a number of years and are now expanding to Sydney. You cant go wrong with a CMP board for the price. A great way to get into SUP. I didn't know bugger all about sup boards, litres, manufacturers anything really. But I did know for sure I wanted to sup in the surf riding waves. So I got two, the learning curve is steep on the boards I have really different to normal surfing but I am having a ball. My advice would be to have a firm idea on where you will use these boards predominantly, search the forums here for advice. I did forget to ask about paddles! Is there a particular one I should use for general use? Typically speaking, people will go for an adjustable paddle as these can be utilised by multiple users (as it adjusts to the users height). In terms of resell (as you mentioned this before), Adjustables will have better resell for this same reason (will fit the next owner). The price difference between paddles is directly associated to the construction and material. Alloy paddles are cheaper and strong but a little heavier than others, Fiberglass are light and Carbon are both strong and light. Obviously Carbon is the more expensive option and more often than not people will eventually upgrade from an Alloy to a Carbon if they stay with the sport and purchased an entry level Alloy paddle. But ultimately any paddle will get you in the water and having fun! I did see you guys have packages which look pretty good value! Hi Kat most stand up paddle board distributors will have try before you buy so it will make your first choice more suitable for you . Hey Andrew, Finally about to buy my first board but went to your site and the Simplicity is no longer there? I remember that board and the Oceanic looks like it's the same or almost the same board as the Simplicity was - just with more vibrant visuals. If you don't like the colour scheme then go the original 10'6" Evoke which is only slightly more but will be fine but not quite as good in the flat water. Forgot to ask Hegdedown, why is it not as good in flat water? The Oceanic has pretty flat longboard shape which will track and glide well in flat water. The Evoke has more of a surf shape which will require changing sides on the paddle more often, and the weight has been trimmed in sections for the surf which mean it's less flexible where you stand. Thanks again guys! I have started going out on a borrowed board with a local club which is great but they have stressed some concerns about me buying a board online WITHOUT trying before you buy. Happy to hear ****elager that you have good things to say :) If you are unhappy with the board do they let you return it?